Dr. Martin Luther King Jr. Day is a time for all Americans to reflect upon Dr. King’s efforts and accomplishments, as well as his unrealized goal of creating a fully equitable and accessible society. In the years following his death, two important issues regarding Dr. King’s work and the Civil Rights Movement seem to have been forgotten, eliminated or at least obfuscated, either intentionally or inadvertently by the mists of time. First, we fail to emphasize Dr. King’s important realization, only a year before his assassination, that his Civil Rights Movement had to include all marginalized people, an insight that linked the Civil Rights and the Disability Rights Movements. Secondly, as he broadened the audience included in the movement, he narrowed the focus of his activity to the issue of employment as the key to achieving the goal of a Just Society. Most people equate the words “minorities and civil rights” with African-American populations; whereas people with disabilities are seldom perceived of as a minority at all, when, in actuality, they comprise the largest minority group in the US. Each minority group has its own life experiences and different sources and degrees of oppression and discrimination. Granted, a blind person has never been lynched because he or she is blind, nor has a person who uses a wheelchair had a cross burned in the front lawn because he moved to a certain neighborhood. 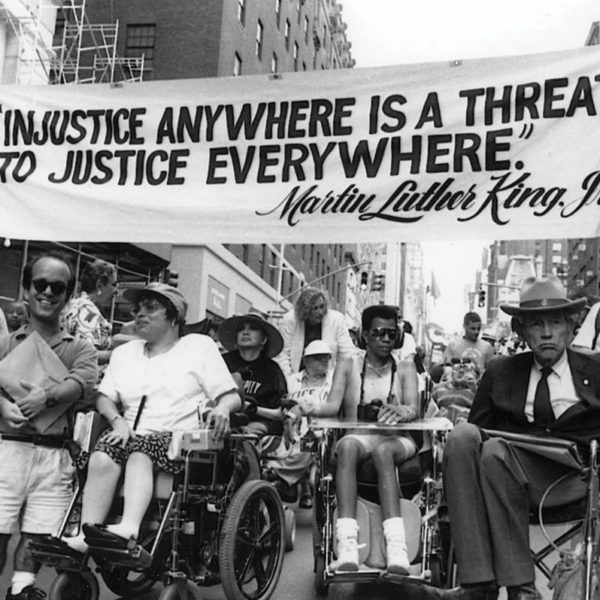 Nonetheless, people with disabilities have been marginalized all throughout history. African-Americans have experienced oppression and discrimination from a system created, legislated and maintained by bigotry and downright hatred; whereas people with disabilities suffer oppression and discrimination at the hands of a paternalistic system that offers “discrimination with the smile” and the best of intentions– intentions that usually reflect a need to maintain the status quo. While people with disabilities cannot equate their experiences with 500 years of slavery and dehumanization, that shouldn’t discount the consideration that members of this minority group, all throughout history, have suffered from dehumanization, infanticide, euthanasia, and institutionalization. In short, Dr. King realized that all marginalized groups—such as African-Americans or Americans with disabilities—must join together and form one united and powerful force working for everyone’s civil rights. Access to meaningful employment and economic independence will help us realize a more just society for all. This year let us remember that in unity we can tap into Dr. King’s power.